Imperio romano en 317, al finalizar la primera guerra entre Constantino y Licinio. Follis de Constantino el Grande (c. 337), mostrando una imagen de su lábaro con el estandarte hiriendo a la serpiente. 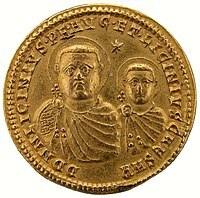 Licinio y su hijo Licinio II con halos, en una moneda de oro de 320 acuñada en Nicomédia. ↑ a b c Grant, 1985, pp. 46-48. ↑ Lieu, 1996, pp. 47,60. ↑ Volz, 1983, p. 201. ↑ Grant, 1985, p. 236. ↑ a b c d Odahl, 2004, p. 180. ↑ Parker, 1958, p. 261. ↑ Gibbon, 1776, p. 180. Richardson, Ernest Cushing (1890). Schaff, Philip; Wace, Henry, ed. From Nicene and Post-Nicene Fathers (en inglés). Vol. 1 (Second Series edición). Buffalo, Nueva York: Christian Literature Publishing Co.
Grant, Michael (1985). The Roman Emperors: A biographical Guide to the Rulers of Imperial Rome 31 BC-AD 476 (en inglés). Londres: Weidenfeld and Nicolson. ISBN 0-297-78555-9. Grant, Michael (1993). The Emperor Constantine (en inglés). Weidenfeld & Nicolson. ISBN 9780297821380. Odahl, Charles Matson (2004). Constantine and the Christian Empire (en inglés). Nueva York: Routledge. ISBN 0-415-38655-1. Zósimo (1982). R. T. Ridley, ed. Zosimus: New History (en inglés). Traducción al inglés de la obra del historiador Zósimo. Canberra: Byzantina Australiensia, 2. ISBN 9780959362602. De Clercq, Victor Cyril (1954). Ossius of Cordova: a contribution to the history of the Constantinian period (en inglés). Catholic University of America Press. Limberis, Vasiliki (1994). Divine Heiress: the Virgin Mary and the creation of Christian Constantinople (en inglés). Londres y Nueva York. Parker, Henry Michael Denne; Warmington, B. H. (1958). A history of the Roman world from A.D. 138 to 337 (en inglés). Methuen & co., ltd.
Volz, Carl A. (1983). Faith and Practice in the Early Church: Foundations for Contemporary Theology (en inglés). Minneapolis: Augsburg Pub. House. Gibbon, Edward (1776). The History of the Decline and Fall of the Roman Empire (en inglés). Vol. II. Lieu, Samuel N. C.; Montserrat, Dominic (1996). From Constantine to Julian: Pagan and Byzantine views: a source history (en inglés). Londres y Nueva York: Routledge. ISBN 0-415-09335-X. Esta página se editó por última vez el 9 may 2018 a las 07:56.